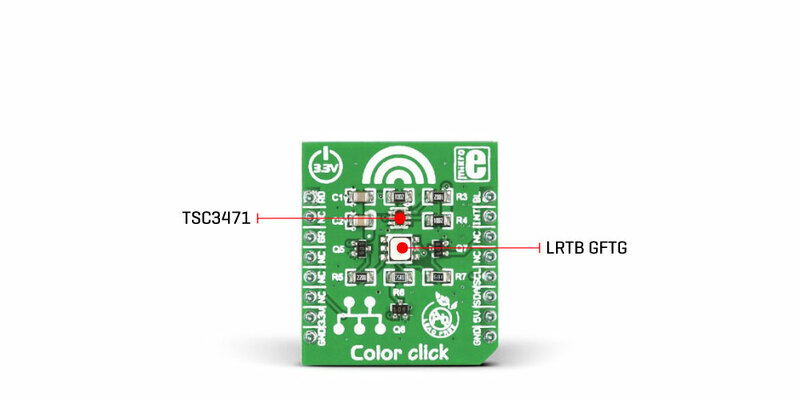 Color click is a color light sensing Click board™, featuring the popular TSC3471 integrated color sensor. It is capable of sensing red, green, and blue light components, as well as the clear light. It has a very high dynamic range of 1,000,000:1, which allows the Click board™ to be used in various light conditions. It is equipped with the additional high brightness RGB LED, so it can be even used in a total absence of any light. The programmable gain of the TSC3471 sensor helps in achieving the optimal color reading conditions, while the advanced programmable interrupt engine with thresholds allows the events to be reported to the host MCU without constantly polling the registers for new data. 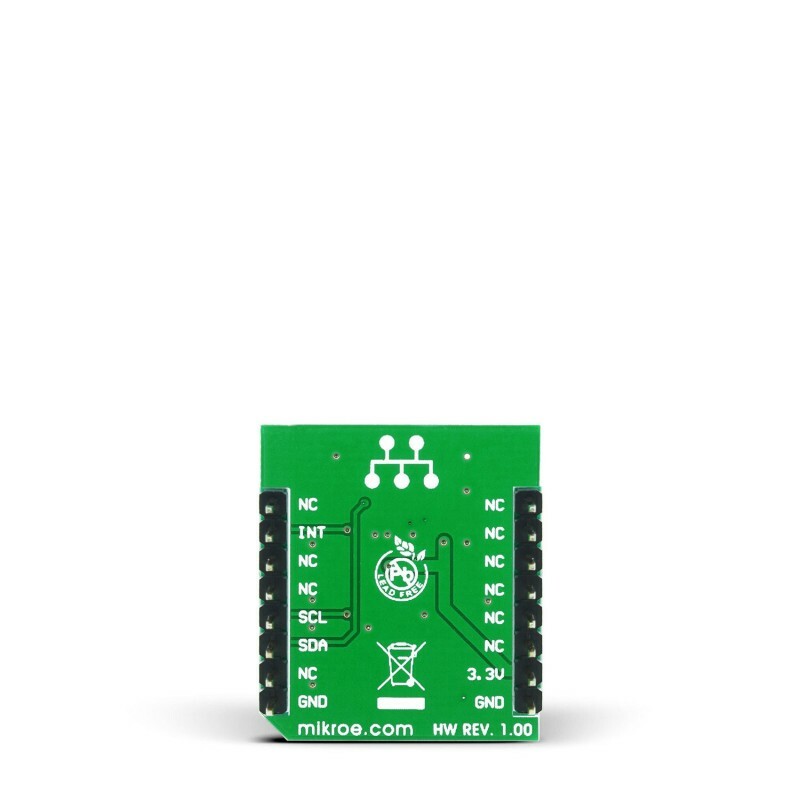 The sensor uses the industry standard I2C interface to exchange data with the host MCU. The high brightness RGB LED can be simply driven by MCU pins since it has three driving transistors onboard which provide enough current for the segments. 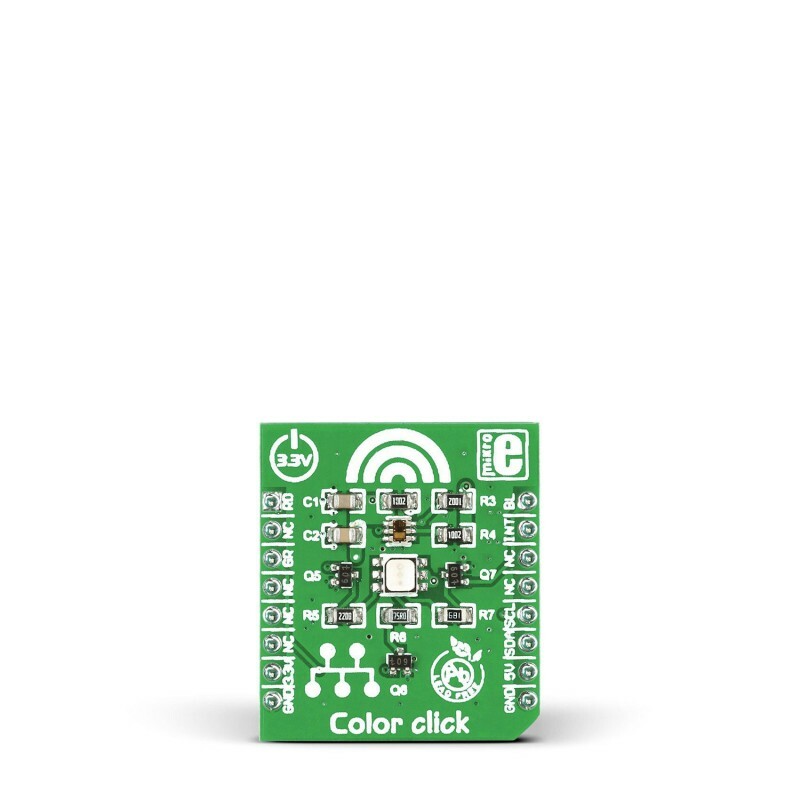 The Click board™ is an ideal solution for various colored light sensing applications, or for simple object recognition. It can be used for the RGB LED color correction, backlight adjustment, in robotics - for the object color recognition, light color temperature sensing, and similar applications that require accurate and flexible color sensing. Color click has two active components used to sense color: it is equipped with the popular TSC3471 integrated color light-to-digital converter by ams-TAOS, and the LRTB GFTG, a high brightness RGB LED, from Osram Opto-semiconductors. The TSC3471 color sensor features a 4x4 array of photo-diodes, which allow detection of each light component: red, green, and blue (R, G, B). Additionally, it can sense the clear light component, too. The sensor IC has a programmable gain control (for all segments simultaneously), applying gain ratios of 1, 4, 16, and 60. This allows the optimal range of the A/D converters (ADC) to be used. 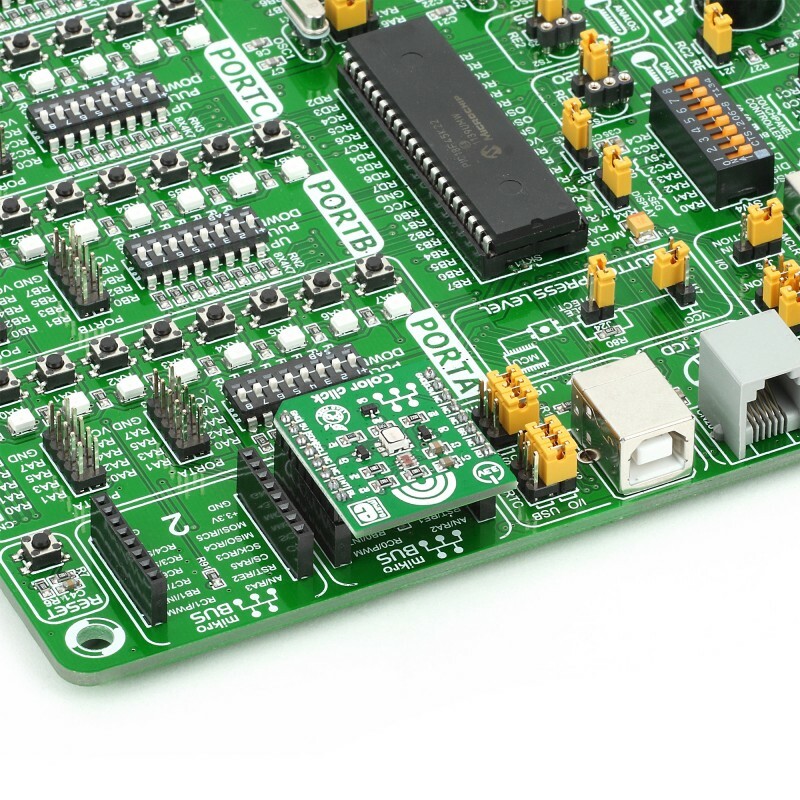 The sensor has an integrating 16-bit ADC section for each channel, performing signal integration, which affects both the sensitivity and the acquisition time. When the conversion is done, the results are stored on the output registers in 16-bit format. The data transfer is double buffered, preventing reading errors, while the conversion is in progress. The sensor does not have any IR filter, thus it has to be placed under the IR blocking glass if sensing ambient light. However, it is ideally suited for the RGB lighting applications, since the LEDs emit light in reasonably narrow spectrum bands, with no IR component. The sensor can achieve dynamic range up to 1,000,000:1 in such scenario. The interrupt pin is an open drain type, routed to the mikroBUS™ INT pin. It is used to alert the MCU when a certain condition is reached: there are two 16-bit registers which contain upper and lower thresholds for the color intensity reading. Furthermore, a persistence filter allows triggering interrupts only when enough out-of-range events are accumulated. The number of out-of-range occurrences before the interrupt is triggered are configured via the appropriate register. The TSC3471 sensor is driven by the state machine. It controls the operation of the sensor, via the state bits found in the ENABLE register. This register contains bits that control the ADC operation, power-on operation, enable interrupt engine, enable wait timers, and so on. The full list of registers and the in-depth explanation is provided in the TSC3471 datasheet. However, libraries provided with the Click board™ offer easy to use functions, which accelerate the prototyping and cut the time to market. The Osram RGB LED is controlled directly, via the GPIO pins of the host controller. The bases of three transistors are routed to AN, CS and PWM pins of the mikroBUS™. Logic HIGH level on the base will bias the transistor so it allows current flowing through the RGB LED segments. The current through the LED is limited by a series resistor, so it won't damage both LED and the transistors. This LED provides a limited amount of controlled light, which can be used to illuminate the measured object in low light situations. Instead of HIGH or LOW logic levels, it is possible to bring the PWM signal to these pins, which will allow brightness control of the R,G, and B segments of the LRTB GFTG. This table shows how the pinout on Color click corresponds to the pinout on the mikroBUS™ socket (the latter shown in the two middle columns). We provide a library for the Color Click on our LibStock page, as well as a demo application (example), developed using MikroElektronika compilers. The demo can run on all the main MikroElektronika development boards. Application Task - (code snippet) - Read color and check which color is detected by the sensor. 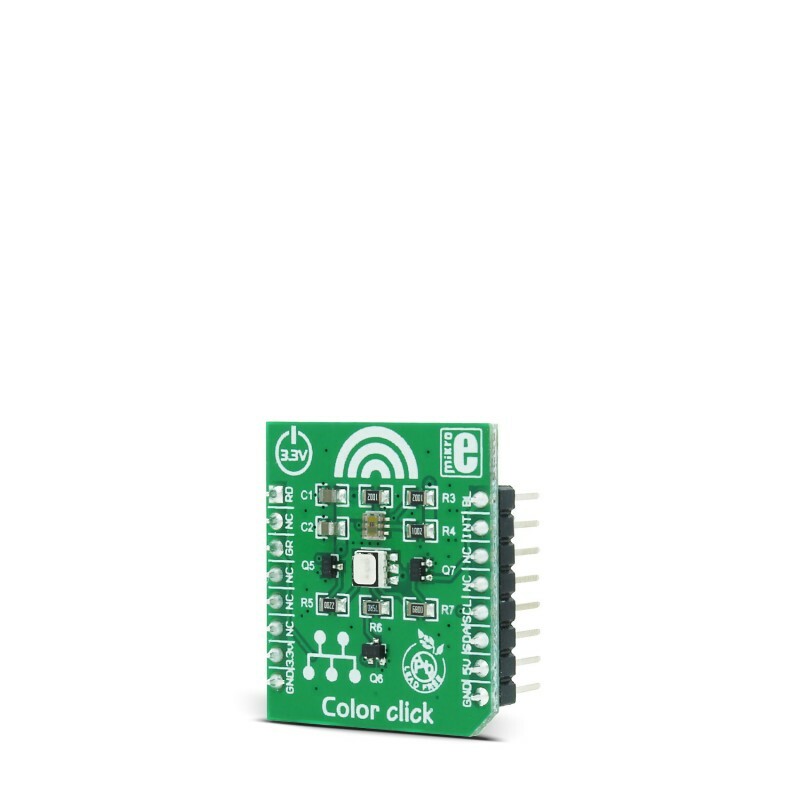 If the color is detected, the detected color message is logged on the USB UART.